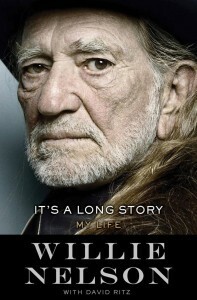 Win a signed copy of Willie Nelson’s autobiography in June’s book giveaway. I grew up with Willie Nelson. My dad moved our family from Poughkeepsie, New York to Austin, Texas in the mid-1970s, when Willie’s presence in Austin was in full effect. In 1973, Willie and Leon Russell held the first ever Willie Nelson Fourth of July Picnic. I was in middle school during those years and could only make inferences about my parents’ sudden adoption of a more relaxed style dress and late-night concert-going. One thing was certain: Dad’s 8-track player assumed a decidedly full time rotation of Willie Nelson’s music, and I absorbed it all. In It’s a Long Story: My Life, Willie Nelson delivers on the promised no-holds-barred look at his life – his youth in Abbott, Texas, his years as a struggling songwriter, his marital struggles, his rise to stardom, his battle with the IRS, and more. 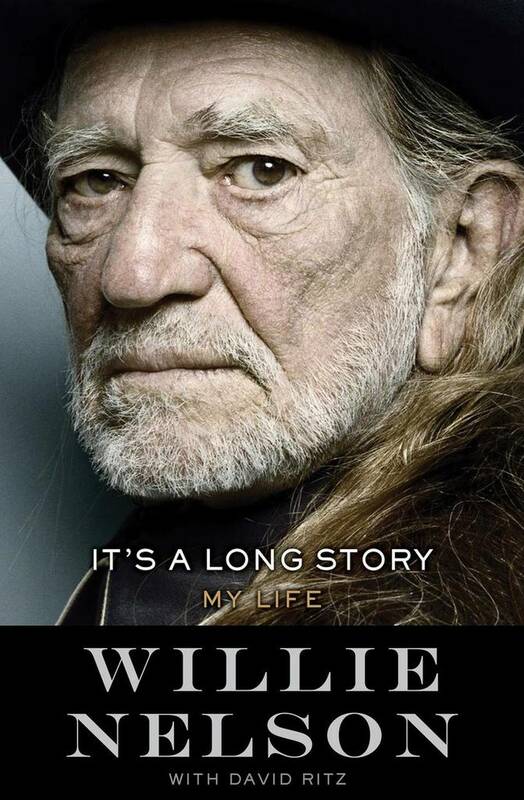 It’s hard to believe that Willie is 82 years old, until you read this book and confront the vast swath of life experience the man has walked through. Plus, I consulted my friend, Math, and Math doesn’t lie. Willie Hugh Nelson was born on April 29, 1933 in Abbott, Texas, which, at the time, was a hamlet of 400 people between Dallas and Waco. Myrle and Ira Nelson, Willie’s wayward parents, left Willie and his sister Bobbie with Ira’s parents, dedicated music teachers who raised the children in a musical household. They were also churchgoers who brought Willie and Bobbie to Abbott United Methodist. Willie’s tastes, however, proved decidedly secular as the young prodigy found his way to lucrative musical engagements outside the church. When he was only a pre-teen, Willie was hired by the bandleader of a polka band that played in the dancehalls around West and Waco, Texas. The Czech community in these parts flocked to the halls, and little Willie strummed his Stella guitar alongside horn players, fiddlers, bass players, drummers and singers. A few years later, Bud Fletcher, a hustler who married Willie’s sister, quickly identified the goldmine he’d stumbled into and formed a band he promoted as “Bud Fletcher and the Texans.” The trio played the clubs and quickly got picked up by the local radio stations where Willie also started spinning records. Were that the catapult that launched Willie Nelson’s career, this would be a much shorter book. Willie spent years criss-crossing not just Texas, but the country. He worked at several radio stations, intermittently worked as an encyclopedia and vacuum cleaner salesman, and traveled to the Pacific Northwest where as a DJ in Portland, Oregon’s KVAN 910 radio station, he met Mae Axton, who at the time was employed by Elvis’s manager, Colonel Parker and had co-written “Heartbreak Hotel” (Mae was also the mother of future country star Hoyt Axton). Mae advised Willie to stop hiding himself in the Northwest and head to Nashville. In a short period of time he wrote some of his most lasting songs, songs like “Night Life,” “Funny How Time Slips Away,” “Crazy,” “Mr. Record Man,” “I Gotta Get Drunk,” and “The Party’s Over.” This work landed him a gig playing in a band, and his confidence soared higher when his friend Paul Buskirk bought his song “Family Bible,” and it climbed to the top of the country charts. That was when he knew it was time to go to Nashville. Willie left his wife Martha and their three children with her parents in Waco and headed to Nashville in his old 1950 Buick which died promptly upon arrival. Fortunately, he ran into Billy Walker, an old friend who took Willie in and introduced him to everyone he knew in the business. WIllie was soon introduced to prolific country singer-songwriter, Hank Cochran, who got him a job writing songs for Pamper Music at $50 a week. Patsy Cline’s version of “Crazy” became one of the best-selling country songs of all time, but it was just one of a string of hits that other artists were suddenly having with Willie’s songs. Faron Young recorded “Hello Walls,” Billy Walker recorded “Funny How Time Slips Away,” and Ray Price recorded “Night Life.” Suddenly Willie had four songs on the top twenty country chart, with “Hello Walls” and “Crazy” also crossover hits on the pop charts. It was 1961, and Willie was on his way up. The publisher calls It’s a Long Story: My Life the complete, “unvarnished” story of Willie’s life, and there’s no disputing that. Willie’s autobiography is not the most literary musical memoir you’ll read, but what it lacks in editorial polish, it more than makes up for in entertainment value. Willie regales readers with numerous stories from his chemically-fueled life on the road, provides deep insight into the origins of many of his hit songs, quotes Khalil Gibran and Edgar Cayce, and waxes rhapsodically about topics diverse as golf, his many musical influences, and his long time love affair with marijuana. Yes, this is the definitive Willie Nelson story. It’s a rare insight into an American folk hero, one told in a voice as powerful and genuine as the red-headed stranger himself.